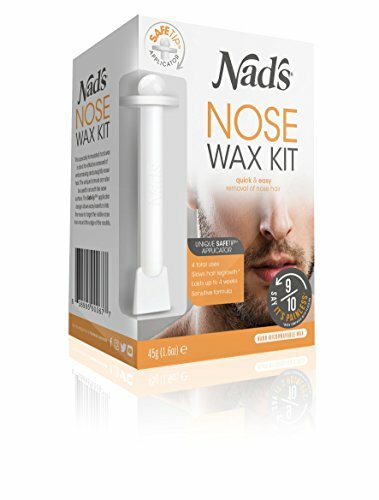 Nad Nose Wax Kit is the world first DIY nose hair waxing kit, removing unwanted hair in minutes and leaving the nostrils hair free for up to four weeks. When coated with the soothing chamomile and aloe-enriched wax, the specially designed SafeTipapplicator fits just inside the nose to remove only the long, visible hairs, leaving the important hair deep inside the nose undisturbed. In a little over a minute, the wax hardens to adhere to unwanted hair, and those embarrassing nose hairs are removed in one go. When it comes to grooming, don neglect the less obvious areas like those embarrassing and unsightly nose hairs! While some nose hair is a natural and necessary part of the body, it can overgrow its area. Nad Nose Wax is not only ideal for inside the nostrils but can also be used on the nose for smoothing the nose surface and even for the mono-brow! We know what you might be thinkingdoes it hurt Well you may be surprised to know that 9/10 say it painless*. Youl find everything you need for a smooth, clean nose in one box! *When compared with plucking. Heat only in a microwave. Do not heat in oven, saucepan or hot water. Keep out of reach of children.